It won’t be cost efficient dollar-cost averaging ETFs because of the trading costs (unless a commission-free broker such as Zecco is used), though DCA isn’t necessarily the best investment method. But I still love the idea of setting up my own all-ETF portfolio. Last year, when I discussed the idea of building model portfolios with ETFs, there weren’t a lot of choices in some asset classes, especially in the fixed income area. Things changed quite a bit since then with the introductions of a few bond ETFs, so there are more choices available, making the task of building my portfolio a little easier. Here, as you can see, I have 30% allocated for foreign stocks, not including those in the REIT and precious metal categories. I always feel that stocks from companies outside the U.S. offer greater growth opportunity (and, of course, the risks that come along with the opportunity), therefore a bigger exposure to foreign stocks will provide long term benefits for my investments. On the other hand, the bond allocation is relatively low. Well, given my time frame, I don’t want to go too conservative. I want to have the funds that 1) provide broader coverage of the markets; 2) cost less to own. Among my selections, some are popular (SPY and EFA) that have been established a long time and some are new (BIV and BWX) which don’t have tracking records. At this point, however, performance isn’t my top concern. Rather I want a low-cost, diversified portfolio with reasonable returns. Since this is a virtual portfolio, I am not going to actually buy any of these ETFs. Other than that, I will treat it as a real investment and do what I am doing for my real investments: make regular purchases and rebalance the asset allocation periodically. As I mentioned early, buying ETFs, like buying individual stocks, involves trading costs. 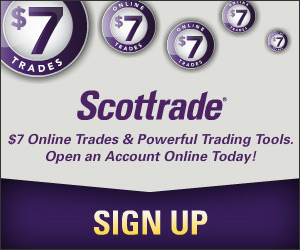 Thus, it’s not realistic to buy a few shares of ETF every month and pay anywhere from $4.95 (TradeKing) to $7.00 (Scottrade) per trade. The only exception is Zecco, which doesn’t charge any commission for the first 10 trades every month. Therefore, I will build this portfolio using Zecco (there are 7 funds in the portfolio, below the 10 trades per month limit) to purchase all 7 ETFs of my choices every month following the asset allocation. I think ETF’s are great. With the recent turn around I put most of our money into ETF’s and only hold a few individual stocks (no mutual funds). However, I might look to different areas with some of the ETF’s. Right now I know the Mid Caps are out performing the S&P 500 (some choices are IJK or an Ultra MVV (2 times the Mid Cap S&P 500 I believe)). At a minimum I might consider something equal weighted rather than Cap weighted (RSP is an Equal Weight ETF…cheaper as well) I’m not sure what I’d do for some foreign exposure. I’ve been burned on it and I know that the S&P is out performing the EFA on a relative strength basis. Christian: I think equal weight fund like RSP performs better when mid and small companies outperform large companies because their have the same weights on the index as their large counterparts (BTW, RSP at ER of 0.40% isn’t cheaper than SPY). Mid and small cap funds have some difficult time recently. Hopefully, things can turn around soon. As for foreign stocks, since EFA is mainly a fund invested in developed economies, a fund for developing markets, such a BRIC fund, will be a good choice. Though financial times have recently affected practically everything since when you wrote this, I think an ETF self-made diversified portfolio is a great idea! I was completely investing illiterate, however, am taking classes – and now I can’t fathom why anyone wouldn’t want to invest in a diversified ETF portfolio for the long-run. Just makes sense to keep costs low with relatively steady long-term growth. My question – as I’m reading your very interesting articles re: ETFs, how do you determine the percentage allocation of your portfolio (i.e. why Domestic @ 40%, Foreign @ 30%, as oppose to another percentage)? Are there any resources you can point to in determining how to allocate funds in a self-made portfolio? Or any advice? There are some books on asset allocations, such as The Intelligent Asset Allocator. It will give you some ideas on how to allocate to each asset class. It’s a good book to read. Eventually, it will come down to your risk tolerance, time frame, etc. that will determine your own allocation.